The Challenge system is a feature available in School Loop Plus. It helps prevent fraudulent user registration. When a new parent registers the account, the system will notify that parent's child (the student) and any other parents already registered as that student's parent. They can challenge the new member's parent registration. 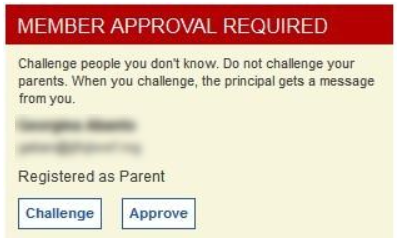 After a parent account is created in School Loop, a red box appears on the associated student's homepage and on everyone's homepage within that student's loop, asking if they wish to challenge the new member registration. When a membership is challenged, a notice is sent to all school administrators via email and listed on the administrator dashboard. The challenged membership is not suspended during this process. Administrators may deny the challenge, delete the new member, or request further information. Challenges ensure the privacy of student information by allowing approved users in a student's education team to question the right of a new registrant to join.